If we were to ask women what is their least favorite step of daily skin care routine, most of them would probably say that it’s make-up removal. It does not make us feel more beautiful, like putting make-up on, and we do not derive satisfaction from it like it is in the case of applying facial masks and using cleansing products. We remove make-up because we have to and not because we like it. Thorough make-up removal is the key thing in taking proper care of your skin. Getting rid of make-up products after a whole day allows our skin to breathe freely and it’s the first step of skin cleansing procedure. You must always remember to avoid wearing make-up for long hours. Make sure you remove it as soon as you get home and never ever go to sleep with make-up on. 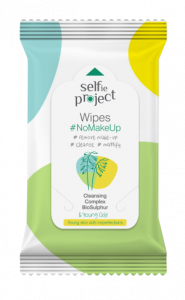 The wipes by Selfie Project allow for fast and easy removal of make-up, without the need to use cotton pads and cleansing lotions. They will remove not only make-up but also excess sebum which is the main cause of acne breakouts. BioSulphur the wipes are saturated with gently exfoliates and smooths the skin, and fights bacteria. Oat proteins moisturize and soothe your skin, preventing redness and irritation. Simply use several towelettes to gently wipe your face. Around the eyes it’s best to only press them to the skin and wait for them to absorb the mascara and eye-shadow residue. You can strengthen the effect by soaking the towelettes in oil or cleansing milk. They can be used to refresh skin on your face and neck when you’re not wearing any make-up, after physical exercise, in hot weather, and whenever you want to have clean and matte skin.